As a human behavior hacker, Vanessa Van Edwards created a research lab to study the hidden forces that drive us. And she’s cracked the code. 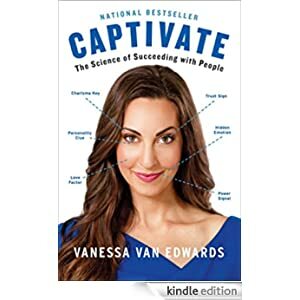 In Captivate, she shares shortcuts, systems, and secrets for taking charge of your interactions at work, at home, and in any social situation. This is the first comprehensive, science backed, real life manual on how to captivate anyone—and a completely new approach to building connections. When you understand the laws of human behavior, your influence, impact, and income will increase significantly. What’s more, you will improve your interpersonal intelligence, make a killer first impression, and build rapport quickly and authentically in any situation—negotiations, interviews, parties, and pitches.